Is that the fiery Twelfth Doctor? He's lived for over two thousand years and not all of them were good. The era of the fiery Twelfth Doctor is upon us and he's a new man! Big Chief Studios presents a fully realized likeness of actor Peter Capaldi as the fierce Time Lord in his series 8 costume! This incredible collector's figure comes packed with numerous accessories, including his Sonic Screwdriver and Psychic Paper! 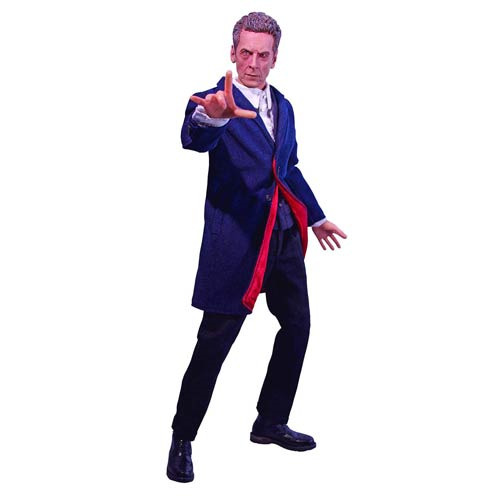 The Doctor Who 12th Doctor Series 8 1:6 Scale Action Figure measure's approximately 12-inches tall. Limited edition of only 1,000 pieces! Ages 14 and up. 8x Interchangeable Hands, Display Base with Illuminating Gallifreyan Symbol and stand, Sonic Screwdriver (Closed), Sonic Screwdriver (Open), Wallet with Psychic Paper, Case with Jelly Baby Sweets, TARDIS Siege Mode Cube, Gloved Hand and Spoon, Yo Yo, TARDIS Series 8 Control Room Printed Backdrop.